Very delicate & simple combination of lustrous pink pearls & glistening rhinestones rings spacer jewelry set birthday or anniversary gift on her special day. 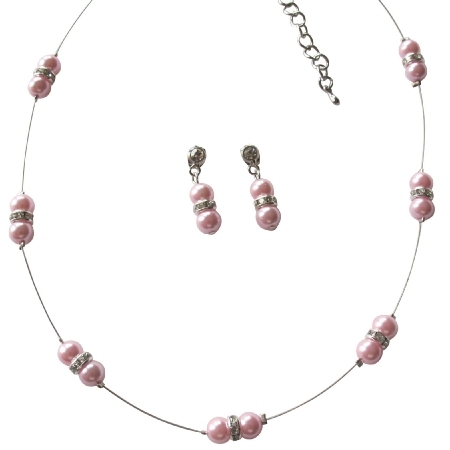 pink pearls adorned in floating illusion necklace with surgical post earrings. Graceful jewelry would make her day & inspired by vintage glamour necklace earrings set for special occasions & modern classics for everyday. The spacer sparkle like diamond & can be dressed up or down for maximum versatility. Material : 8mm pink pearls adorned in illusion wire with rhinestones rings spacer with surgical post earrings.